As I mentioned in my previous post, I often see this belief in product development that adding new product features to a product will help spur growth. The thinking behind it is basically that more features == more value == more growth. I disagreed with that thinking in my previous post and received a few questions about that point, so I will expand upon it in this post. A) Most important is mass adoption by the user base. Over 50% of the users will need to interact with the feature on a regular basis (i.e. daily or weekly basis). B) The feature creates an engagement loop that allows you to email or notify users on a regular basis. The content in those emails/notifications also needs to be compelling enough that it maintains a high click through rate over time. C) Or as an alternative to B, the feature is a step-change improvement in the core value of the product for a majority of the userbase. To put this hypothesis to the test, Facebook serves as a great case study of which types of features drive Growth and which do not. Over the years, they have launched Photos, News Feed, Platform, and Chat, which have all been major drivers of growth and engagement. However, they have also launched Questions, Places, Deals, Gifts, and Timeline, which have not fared as well in terms of driving growth and engagement. Photos: Photos was launched in 2005 and was one of the first major new features Facebook added after launch. Facebook has stated before how successful the Photos product was at driving engagement. If we look through the lens of the criteria laid out above, we can start to understand why. A) The majority of users upload photos or are tagged in photos. B) Tagging allows Facebook to re-engage users and has been so successful that Facebook has heavily invested in facial recognition to make tagging easier. C) Photos provides a significant increase in the core product value by allowing people to much more easily share important moments and events in their lives and allowing people to be much better connected with what their friends and family are doing. A) Pretty much 100% of users view their News Feed. B) News Feed dramatically improved the content sharing engagement loop. After News Feed, when someone shared a set of photos or a status update, those shares had dramatically higher visibility compared to when they were only visible by navigating to a user’s profile. This meant that these posts now received many more likes and comments that Facebook would then notify the user about. 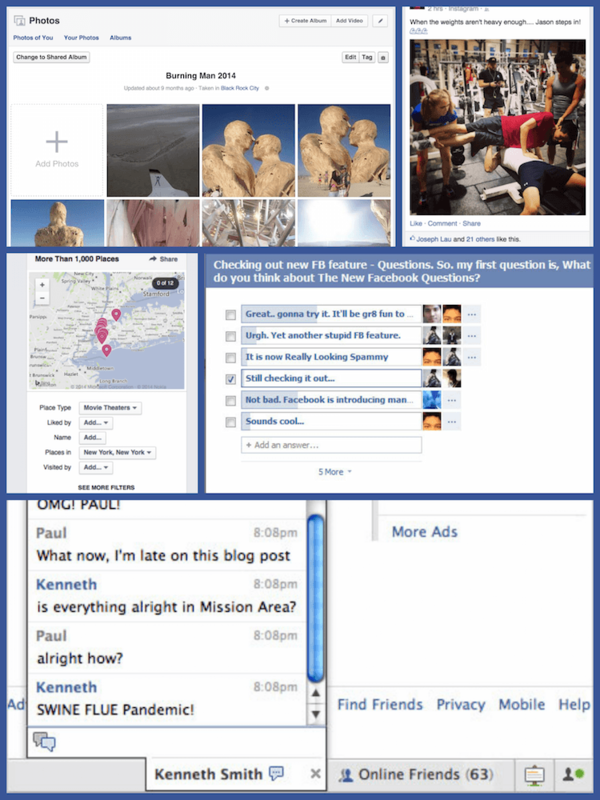 C) News Feed provided another step-change improvement to Facebook’s mission. It was now much easier to passively stay connected to friends by seeing their posts and updates. As previously mentioned, it also fundamentally altered Facebook’s value proposition. It was no longer just a way to keep in touch, but it was now a way to broadcast and communicate with your social graph. Platform: In a bold move at the time, Facebook opened up their platform to third party developers in 2006 . Although Facebook has since clamped down significantly on the platform in the interest of user experience, Facebook Platform was a big engagement driver for a period of a few years. A) For the first few years, a significant percentage of users interacted directly with Facebook apps or would get notifications from others using the apps. B) Facebook outsourced the work of constructing the engagement loop to third-parties. Apps like Farmville, etc. had to create their own engagement loops to survive by using gamification mechanics such as crop harvesting to bring users back. By bringing a user back to Farmville, Zynga also brought a user back to Facebook. They also generated billions of notifications to Facebook users by getting users to spam app requests out to friends until Facebook finally clamped down on the app request spam. C) Social gaming was the primary category of app that achieved significant traction on Facebook Platform. Those apps did little to improve Facebook’s core product value, so point C is not applicable. A) To ensure mass adoption, Facebook made Chat highly visible by including it as a sidebar overlay on every page. B) Chat creates a very compelling high-frequency engagement loop. C) Chat again significantly expanded on the ability for friends and family to stay connected through Facebook and eventually evolved into Facebook Messenger. Questions: Launched in 2010 , possibly as a jab at Quora co-founder and former Facebook CTO Adam D’Angelo, Questions never really gained much traction. A) The number of users using questions rapidly dropped off after the initial launch. B) Questions did create an engagement loop, but the frequency was relatively low. C) Questions was an incremental improvement and did not significantly expand on Facebook’s value proposition since people could already ask questions by just posting a status update. Places: Also launched in 2010 , Places was Facebook’s response to the surging popularity of Foursquare. Places promised to enable people to share where they were. A) Facebook probably did get over half the users to use Places through both checkins and location tagging in photos. B) Places did not create an engagement loop. C) Places was an incremental improvement and did not significantly expand on the value proposition with regards to sharing since people could already share where they were through status updates or picture descriptions. A) Fewer than 50% of users bought a deal/gift. B) Deals and Gifts did have the potential to create an engagement loop via a daily email, but Facebook didn’t capitalize on it. Even if they did, they would have discovered the same thing Groupon and LivingSocial did, which was that click through rates on the emails decay significantly over time as users grow tired of receiving deal after deal (or gift) they are not interested in buying. C) Deals were not tied to Facebook’s value proposition at all. Gifts at least helped people be more connected, but the frequency was too low and the consumer adoption wasn’t there. Timeline: Introduced in 2011, Timeline served two purposes. First, it was meant to help users rediscover things they had shared in the past and second, it allow users to more easily share from other apps . However, according to insiders, it did not lead to any significant gains in growth or engagement. A) Over 50% interact with Timeline. B) Timeline did not create a significant engagement loop. It generated a lot more posts from apps, but due to the trivial nature of the information being shared, they did not receive many likes and comments compared to organic shares and posts. C) Timeline was more of an incremental improvement in the core product value rather than a step-change. In terms of being connected to friends and family, sure, you could now more easily scroll through hundreds of posts your friends had made over the years, but no one does that on a regular basis. In terms of sharing, the data shared from apps was trivial information such as a song you listened to or an article you read, but it didn’t necessarily mean you liked the song or thought the article was interesting, so the share had little value. Should we stop all core product feature development that doesn’t meet these criteria? Of course not. Core product teams should continue to develop features to make the product incrementally better and make users happy. However, if you are contemplating adding a new feature on the basis of expecting it to drive growth and engagement, you should ruthlessly evaluate it against these criteria. Acknowledgements: Special thanks to Casey Winters and Stephanie Egan for helping review and refine this post.